DC Universe Animated Original Movies - SUPERMAN/BATMAN: APOCALYPSE | Warped Factor - Words in the Key of Geek. As we continue our look back the the movies from the DCUAOM, Da'Mon Guy revisits 2010s Superman/Batman: Apocalypse. Superman/Batman: Apocalypse is full of action but it doesn’t contain the substance of some of DC Comics other animated releases, such as Batman: Under the Red Hood or All-Star Superman. “Apocalypse” is comprised of a talented voice cast, which has become the norm for DC Comics when making these animated features, including Tim Daly as Superman, Kevin Conroy as Batman, Andre Braugher as Darkseid and Summer Glau as Supergirl. “Apocalypse” begins in Gotham City as it is being hit by a meteor shower caused by the events which took place in “Superman/Batman: Public Enemies.” This meteor shower brings the arrival of a strange girl who quickly whisks through Batman's city creating a level of catastrophe, and displaying the same powers as Superman. On the run and out of control the girl causes all kinds of damage which opens the door for the appearance of Superman to come in and save the day. We later learn that the girl is Kara Zor-El, Superman’s cousin Supergirl, this story is actually about her and more of a coming of age tale. Superman/Batman: Apocalypse is unfortunately lacking in the area of substance, it doesn’t really do anything to develop our heroes. 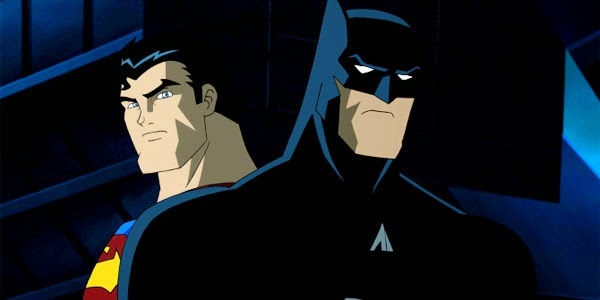 Superman and Batman are no different in this incarnation than any other film or cartoon that has been previously done, there is an emphasis on the two contrasting personalities of the characters but that is the lone detail presented. So we have Superman as the ever optimistic hero and Batman portrays the clearly more pessimistic and cynical one. This dynamic is the focus and driving point of the story, but outside of the occasional verbal debate there wasn’t enough to show the difference or enhance the friendship that they share. However, what Superman/Batman: Apocalypse does is showcase Superman's longing for family and his need to fit in. This movie, more than any other, emphasizes his desire to have some kin with someone of his own race, which brings me to the best part of the film - the supporting characters. All of them enhance the story and make it worth watching. Supergirl, Wonder Woman, Harbinger, Darkseid, and Barda all make the story much more appealing and the add depth that is missing from the two leading characters. The introduction of Kara as the spoiled teenager creates all kinds of tension for the other characters, but it's Wonder Woman (whose role in DC Comics has been redefined) who is clearly was the stand out character in this story. Her strong, intense personality was a welcome addition, watching her stand toe to toe, and not settling for being the third wheel, against Superman and Batman was really good. Barda’s desire for normalcy is not a new ideal for superheroes but watching her walk around in her suburban home trying hide the arrival of the superheroes was a nice touch. Superman/Batman: Apocalypse presents plenty of action, enough to satisfy any adrenaline junkie, with some big and bold fight scenes, however when it comes to the story I think anyone who isn't a real lover of the comic book genre is likely to be disappointed.